Research In Motion’s Blackberry Play Book did not receive a warm welcome like the iPad2. There are several reasons that contributed to this factor. This article will outline some of the negative aspects of the newly released Play Book. The Name: The name, “Play” Book, itself is a bit deceiving. RIM probably wanted to capture the general Tablet market with the name. However, the apps supplied with the tablet mainly attract the business class. This may be a good thing for RIM as Apple has already captured the general market. Lack of Apps: Apple App store has more than 300,000 Apps. Android Market Place has more than 200,000 Apps. Blackberry? Just over 15,000 Apps. Blackberry apps are rather scarce and poor in quality. Blackberry did say that the Playbook will support Android 2.3 apps in the future. That will significantly broaden its app choices. The flash feature included in the device has some flaws. Timing: Many have complained that the Play Book was rushed into the market. We believe that it was rather delayed. A company like RIM should be able to come up with a tablet in a much faster pace than most other tech companies. Even Samsung, HP, Motorola, Dell and others have come up with a tablet way before RIM. To top it up, Apple had already come up with iPad 2 which really downgraded the Playbook since Playbook was created in response to the original iPad 1. Target Consumers: Blackberry is an icon for the business world. This initial branding may have been a factor for RIM to be not able to reach out to the general public. Moreover, the supplied apps and features don’t really attract the youth and pure entertainment oriented consumers. The security and enterprise connectivity will benefit the business class but other than that, who cares about these features? Lack of Native Email, Calendar and Contacts: Blackberry Play Book fails to have built in Email and calendar software of its own. 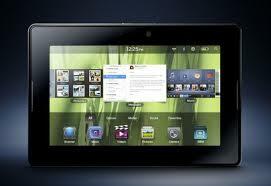 The features are only enabled when the tablet is paired with a Blackberry Smartphone. Hence, the unit does not function independently. Battery Life: The Play Book has been criticized heavily for its poor battery life. Compared to other tablets, the Play Book received the lowest rating for battery life. For example, continuously browsing the web through wi-fi gave the Play Book an average battery life of only 7.6 Hours. On the other hand, iPad 2 got 11 hours, Motorola Xoom got 10 hours and iPad 1 got 10 hours. BlackBerry is only made for business persons. And Playbook is not any exception. With the name ‘Play’, someone might assume that it’s made for gaming and fun things.